What is Secondary Containment? | Blackwell's Inc.
Go in just about any industrial facility in the United States, or anyplace else in the world, and you'll see tanks, vats, and barrels of all sizes and descriptions, inside and outside the facility. What do they contain? ANYTHING. They can contain anything that is needed to process the materials produced by the facility. Liquid hazardous materials in these containers, such as petroleum products, antifreezes, solvents, acids, and any number of other materials, can be a threat to soil, ground water, surface water, and the facility and workers, if accidentally spilled or leaked. Facilities of any type should expect the unexpected, and be prepared for an accidental chemical spill or leakage, with secondary containment. 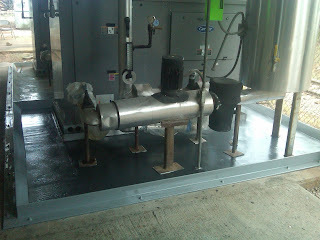 to contain oil leaking from this equipment. So what is secondary containment? It is a liquid-tight barrier that will contain the spill if accidentally released from the the primary container. Imagine a 5 gallon container (primary containment) of a hazardous material inside a 55 gallon barrel (secondary containment). Should a leak occur, the 55 gallon barrel would contain the material. It's a form of insurance. Blackwell's Inc. can install chemical resistant containment areas in facilities throughout the southeastern United States. Our experience allows us to construct secondary containment areas even in difficult and challenging sites.